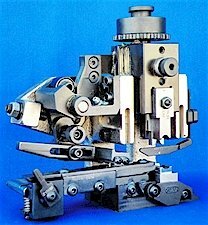 Diamond Die and Mold designs and manufactures crimp tool, wire harness equipment such as, terminating applicators, terminating presses, hand crimper, and perishable crimp tooling. Over the past 60+ years, we have built a reputation for producing quality parts at competitive prices with on-time delivery. Our terminal applicators are used extensively worldwide by major wire harness manufacturers, and will fit into AMP crimping machines/presses. Our dies and presses are built for maximum life, using only the highest quality tool steels. Our crimp finishes are considered the best in the industry. Our quality (ISO 9001:2015 certified) and experience makes Diamond Die the right choice for your tooling and equipment production requirements. Diamond Die & Mold has the knowledge, skill, and capacity to meet any customer specifications, and we specialize in meeting customer-timing requirements. Diamond Die and Mold specializes in the design and manufacture of Wire Terminating Applicators, terminating presses, hand crimpers, and perishable tooling. This is our only business and has been for the past fifty years! 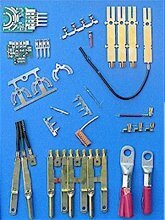 Our experience in supplying and servicing the wire harness and electronics industries makes us qualified to furnish the "right" tooling and equipment that meets your production requirements. Diamond terminal applicators are used extensively by many of the nation's major wire harness manufacturers. Our dies, presses, and precision parts are built using only the highest quality tool steels for maximum life. Our finishes in the crimp area are unquestionably the best in the industry. We have the knowledge, skill, and capacity to meet any customer specifications, and we specialize in meeting customer-timing requirements. As an ISO 9001:2015 certified company (since 1996), all of our dies undergo rigorous inspections at specified stages throughout the manufacturing process. We have built our reputation on producing quality parts at competitive prices with on-time delivery. Please contact us for a review and quote for your specific requirements. We are certain it will be time well spent. The contents of this webpage are Copyright © 2019 Diamond Die & Mold. All Rights Reserved.